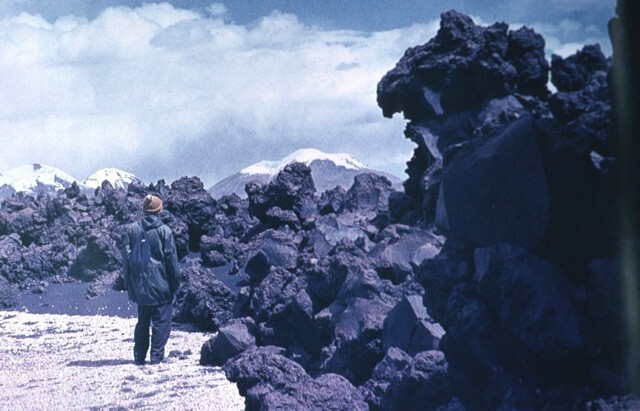 The Global Volcanism Program has no activity reports for Parinacota. The Global Volcanism Program has no Weekly Reports available for Parinacota. The Global Volcanism Program has no Bulletin Reports available for Parinacota. Volcán Parinacota is the southernmost and youngest of a pair of volcanoes forming the Nevados de Payachata group along the Chile-Bolivia border. 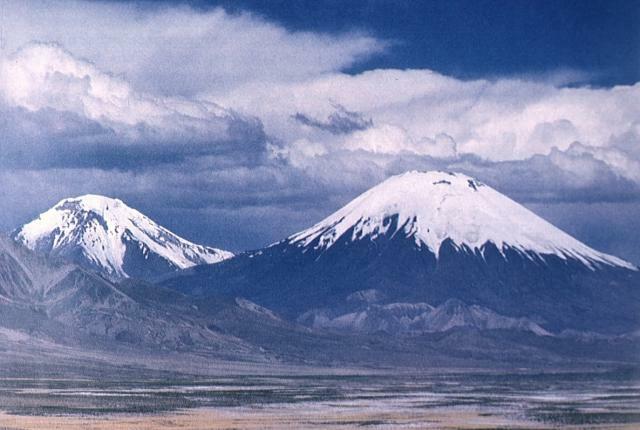 The symmetrical, 6336-m-high volcano forms a twin volcano with the dominantly Pleistocene, 6222-m-high Pomerape, which towers above a low saddle to the NE. Collapse of Parinacota about 8000 years ago produced a 6 km3 debris avalanche that traveled 22 km W and blocked drainages, forming Lake Chungará. Holocene eruptive activity has subsequently reconstructed the stratovolcano, which contains a pristine, 300-m-wide summit crater and youthful lava flows on the W flanks. Although no historical eruptions are known, Helium surface-exposure dates have been obtained for eruptions during the past two thousand years both from the main cone and the Ajata group of satellite cones and lava flows on the S and SW flanks. Clavero J E, Sparks R J S, Polanco E, Pringle M S, 2004. Evolution of Parinacota volcano, Central Andes, Northern Chile. Rev Geol Chile, 31: 317-347. Clavero J E, Sparks R S J, Huppert H E, Dade W B, 2002. Geological constraints on the emplacement mechanism of the Parinacota debris avalanche, northern Chile. Bull Volcanol, 64: 40-54. Davidson J P, McMillan N J, Moorbath S, Worner G, Harmon R S, Lopez-Escobar L, 1990. The Nevados de Payachata volcanic region (18° S/69° W, N. Chile) II. Evidence for widespread crustal involvement in Andean magmatism. Contr Mineral Petr, 105: 412-432. Gonzalez-Ferran O, 1974. Arica - Nevados de Payachata. IAVCEI Andean Antarctic Volc Problems Guide Book - Excursion A-1, 3-35. Worner G, Harmon R S, Davidson J, Moorbath S, Turner D L, McMillan N, Nye C, Lopez-Escobar L, Moreno H, 1988. The Nevados de Payachata volcanic region, I: geological, geochemical, and isotopic observations. Bull Volcanol, 50: 287-303. There is no Deformation History data available for Parinacota. There is no Emissions History data available for Parinacota. Symmetrical Volcán Parinacota rises north of Lake Chungará in the foreground. The lake was formed when collapse of an ancestral Parinacota edifice about 8000 years ago produced a massive 5-6 cu km debris avalanche that dammed a preexisting river. Subsequent eruptions of andesitic aa lava flows and andesitic pumice and scoria flows constructed the modern conical edifice, obscuring the avalanche source scarp. The summit of Parinacota volcano contains a pristine, 300-m-wide crater. The Nevados de Payachata volcanic group in northern Chile, seen here from the west, consists of the symmetrical, 6348-m-high Parinacota volcano (right) and its older twin volcano, Pleistocene 6222-m-high Pomerape volcano (left). The young cone of Parinacota post-dates collapse of an older edifice about 8000 years ago. The most recent activity at Parinacota produced a series of fresh-looking lava flows from satellitic cones on the south and SW flanks. 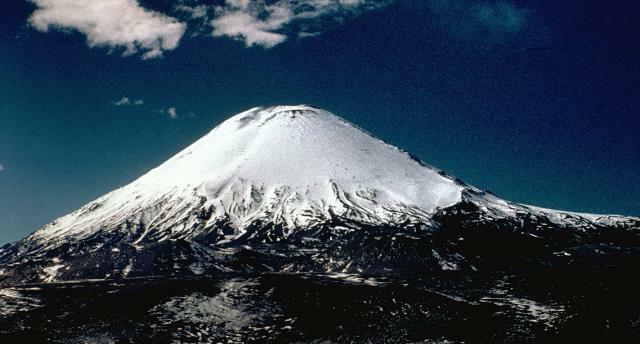 Volcán Pomerape is the northernmost of twin stratovolcanoes forming the Nevados de Payachata along the Chile-Bolivia border. 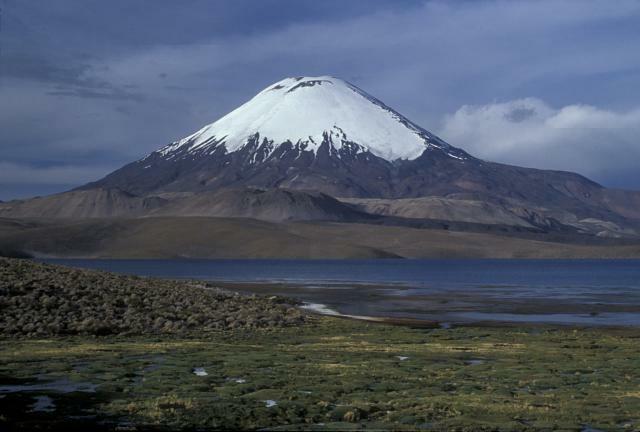 The 6282-m-high Pomerape lies across a saddle from Parinacota volcano, out of view to the right. The glacially dissected Pomerape was constructed above a base of dacitic-rhyolitic lava domes. 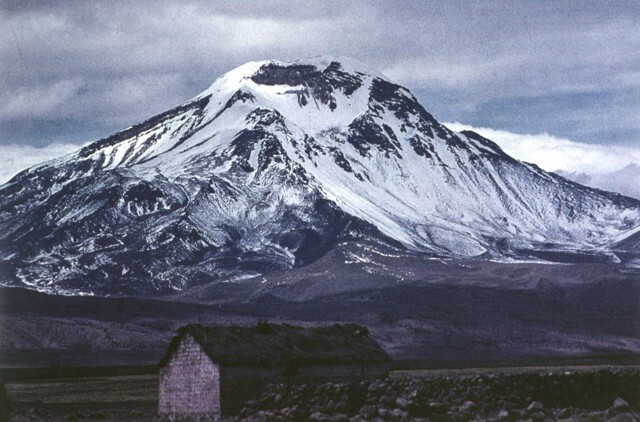 The dominantly andesitic stratovolcano is capped by dacitic breccias and is of dominantly Pleistocene age. 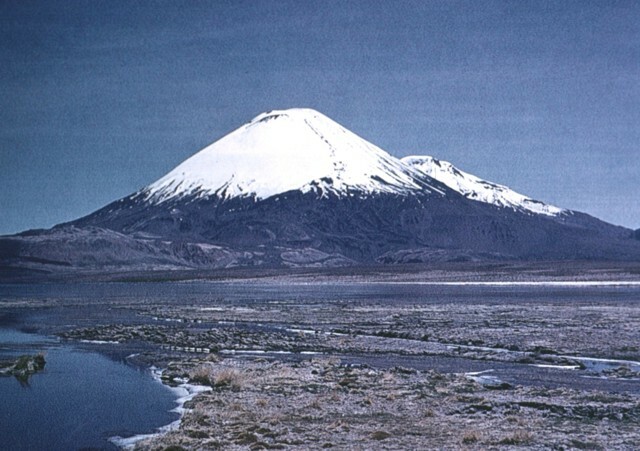 The southern side of conical, glacier-clad Parinacota volcano is seen from south of Laguna Changará, with its twin volcano, Pomerape, visible in the distance behind its right-hand flank. A complex of lighter colored dacitic-rhyolitic lava domes can be seen at the SW flank of Parinacota (middle left). The main cone of Parinacota was constructed during the Holocene primarily by the effusion of andesitic lava flows following collapse of an earlier edifice. The youngest of these flows was dated at between 1300 and 2000 years ago. 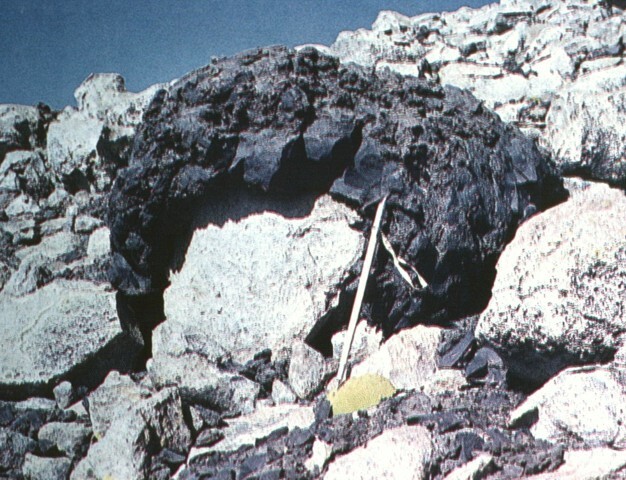 A dark-colored andesitic volcanic bomb, ejected in a plastic state with a ballistic trajectory, drapes older rhyolitic rocks. The bomb was ejected during the Ajata volcanic eruptions. Helium surface-exposure ages ranging between about 1385 and 6500 years ago were obtained from the three lava flows erupted from the Volcanes de Ajata. Note the ice axe for scale (right-center). This viscous andesitic aa flow was erupted from the Volcanes de Ajata cinder cones along a N-S fracture on the southern flank of Parinacota. Helium-exposure ages of about 5985 and 6500 years ago were obtained from the lowermost and oldest of three lava flows of the Volcanes de Ajata. 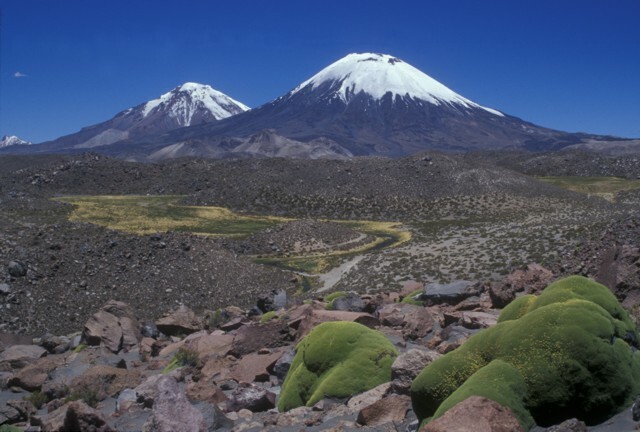 Snow-capped Acotango, Sajama, and Guallatiri volcanoes form the horizon to the east. The Nevados de Payachata volcanic group, the scenic highlight of Lauca National Park, is seen here from the SW and consists of the symmetrical, 6348-m-high Parinacota volcano (right) and its older twin volcano, Pleistocene 6222-m-high Pomerape volcano (left). Collapse of Parinacota about 8000 years ago produced a 6 cu km debris avalanche that formed the hummocky terrain in the foreground, with the colorful Llareta plant at the lower right. Hummocks in this medial portion of the avalanche deposit are about 50-100 m high. Glacier-clad Volcán Parinacota rises to the NE above Laguna Chungará near the Chile-Bolivia border. The lake was formed when collapse of Parinacota about 8000 years ago produced a 6 cu km debris avalanche that traveled 22 km to the west and blocked drainages. Subsequent eruptions constructed the 6348-m-high symmetrical stratovolcano, which towers above late-Pleistocene andesitic-to-rhyolitic lava domes and flows in the middle ground. 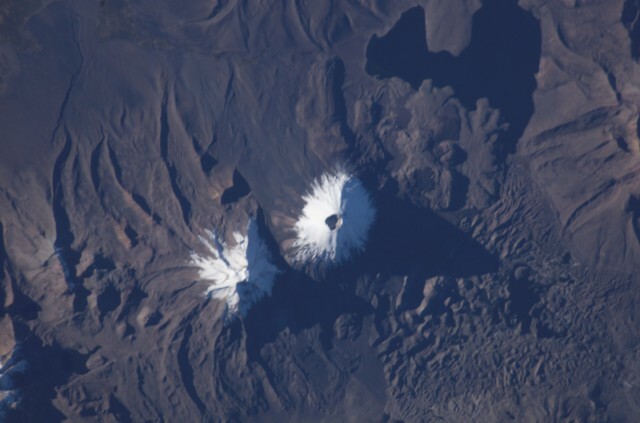 The twin snow-capped volcanoes of the Nevados de Payachata volcanic group dominate this NASA Space Shuttle image (with north to the bottom). A prominent summit crater tops symmetrical Parinacota volcano, constructed to the SW of its eroded Pleistocene twin, Pomerape volcano. Silicic lava flows from Parinacota form lobes extending into Laguna Chungará, which was formed when a major debris avalanche from Parinacota blocked drainages. The hummocky debris-avalanche deposit covers much of the lower right part of the image. NASA Space Shuttle image ISS009-E-6837, 2004 (http://eol.jsc.nasa.gov/). 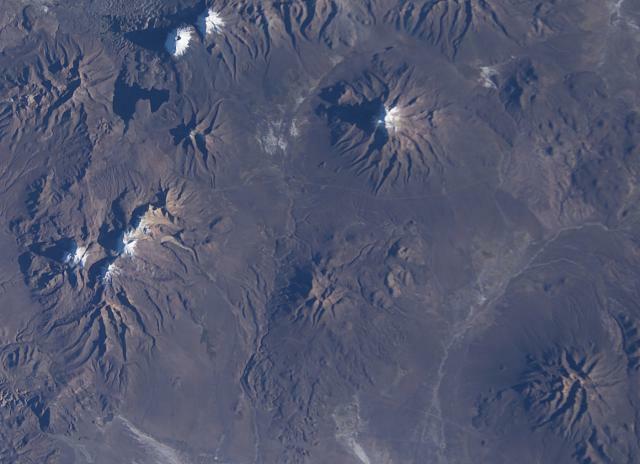 Snow capped volcanoes dot this NASA Space Shuttle image (with north to the upper right) taken along the Chile-Bolivia border. The snow-capped peak at the far left-center is Guallatiri volcano, and to its right are the three peaks of Nevados Quimsachata, which includes Acotango volcano. The twin peaks at the upper left are Pomerape and Parinacota, with Laguna Chungara below. Nevado del Sajama in Bolivia lies at the upper right-center. At the lower right is the snow-free volcano of Macizo de Larancagua. NASA Space Shuttle image ISS009-E-6848, 2004 (http://eol.jsc.nasa.gov/). There are no samples for Parinacota in the Smithsonian's NMNH Department of Mineral Sciences Rock and Ore collection. Large Eruptions of Parinacota Information about large Quaternary eruptions (VEI >= 4) is cataloged in the Large Magnitude Explosive Volcanic Eruptions (LaMEVE) database of the Volcano Global Risk Identification and Analysis Project (VOGRIPA).